Afghanistan's Election Commission on Tuesday ordered a runoff election after a fraud investigation dropped President Hamid Karzai's votes below 50 per cent of the total polled. Earlier in the day, Karzai accepted the fraud panel's finding and endorsed a runoff election. "We believe that this decision is legitimate, legal and constitutional and that it strengthens the path towards democracy," he said in remarks shown live on Afghan television. The new election date was announced after a UN-backed Afghan complaints commission confirmed staggering levels of fraud in the August 20 presidential vote. The panel report said fraud occurred at more than 3,000 polling stations. It ordered that all the ballots at 210 of those stations be invalidated. Some voting stations showed fraud on up to 96 per cent of the ballots, according to the commission's report. 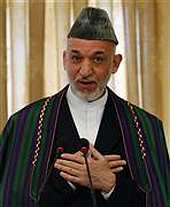 "This is not the right time to discuss investigations," Mr Karzai said. "This is the time to move forward to stability and national unity. Analysts say Karzai is likely to win the run-off, but the scale of fraud alleged in the first round may cast a large shadow over the legitimacy of his rule.